Well I found this tidbit of motivation and thought YES!!! That's what I need to post! These rules are easy to follow & are honest. I run every Saturday, Monday, & Wednesday now. legs are sore, etc. and it was too hard for me to keep at it that often. Plus honestly I was getting burned out running so often. 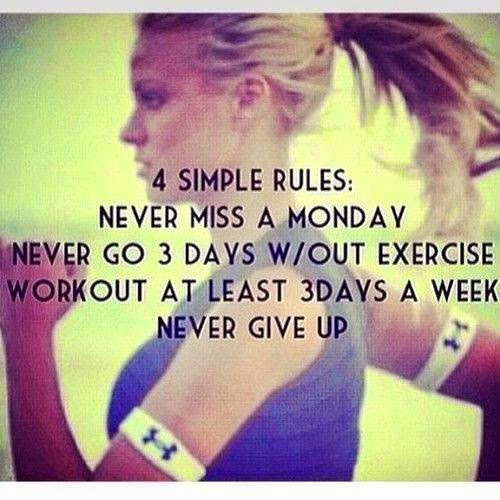 So now I limit myself to 3 days (sometimes 4 if my schedule permits) of working out & running. I run at least 3.12 miles each time & Saturday mornings are my long runs. It keeps me in shape & I don't feel bored or like I don't want to run each time. Find your perfect schedule and get out there. No one will push you except you!